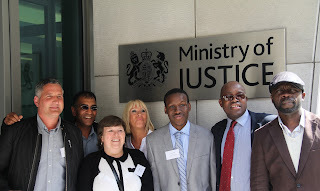 13 service users involved in User Voice projects across the country visited the Ministry of Justice yesterday in order to speak with the Prisons, Probation and Youth Justice Minister Jeremy Wright. This was a unique opportunity for the Government to find out from current service users what they think of the proposed changes that are about to take place within the criminal justice system. The 13 Reps spoke from their own personal experience, but also articulated the opinions of the service users they represent as members of User Voice Community Councils in London, Kent, Cumbria and Northumbria. The group also included one member of one of the User Voice Prison Councils, who was granted Release on Temporary Licence for the day specifically to attend this meeting. In total, they represented some 27,500 service users across the UK. I wouldn't have thought I would be stood outside the Ministry of Justice let alone inside it, talking to the Minister.